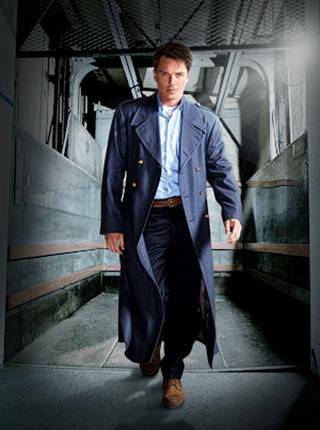 Fans of the original hit BBC franchise “Torchwood” will notice Captain Jack Harkness sporting a new version of his iconic coat in the new season “Torchwood: Miracle Day” set to premiere on STARZ on Friday, July 8th at 10pm ET/PT. The military inspired piece of sci-fi couture was previously made of wool, appropriate for the Wales climate where the series was first shot. The newly redesigned version is a cashmere blend that gives the attire more movement, better fit and breathability for the U.S. installment that was primarily shot in Los Angeles. Series creator Russell T Davies tasked the show’s costume designer, Shawna Trpcic (“Dollhouse,” “Firefly” and “Angel”) to make a new version of Jack’s iconic coat.